What exactly did people believe in post-reformation England? That deceptively simple question really goes to the heart of much of the ‘post-revisionist’ scholarship currently being generated by historians of the English reformation. Whether the object of study is angels, the landscape, music or death, one underlying questions remains the same: what does this thing, this practice, this shred of belief tell us about the broader tapestry of post-reformation religious identity? Tapestry is a reasonable metaphor – I’m going to refrain on this occasion from extending it too far, and talking about warps and wefts – but patchwork is a better one, the term coined by Tessa Watt in her brilliant book Cheap Print and Popular Piety. Once or twice when teaching this I have actually taken to drawing an imaginary ‘patchwork’ on the whiteboard. So what do we call the hypothetical individual, who believes he will be justified by faith but also thinks that if he doesn’t confess his sins he could be condemned to hell for them? What about his wife, who sings metrical psalms and hates the pope but believes God to be physically present in the consecrated host? And however we define such individuals, can we also reasonably group them together? It is possible to recognise their difference, and at the same time claim they are one and the same? So tapestry is OK, patchwork is better: palimpsest works pretty well too. Tangentially, I wonder why so much of the metaphorical language we use to describe identity formation (there’s another one) is rooted in the everyday materiality of art and craft. Our ability to label individual belief in the past seems inversely proportional to the amount we know about it. I suppose that is a fairly natural state of affairs. Complexity breeds complexity, and moulds certainty into uncertainty. But the job of the historian is (I think) not just to (re-)present the past, but also in some sense to try to make sense of it. So, for AG Dickens the majority of people in Elizabethan England were recognisable as Protestants; for Eamon Duffy they were perhaps traumatised Catholics; for Christopher Haigh, stiff-necked Parish Anglicans; for Judith Maltby, committed Prayer-Book Protestants; for Watt, their culture was ‘distinctively post-Reformation, but not thoroughly Protestant’; while for Robert Delumeau, the people of early modern Europe were probably not even thoroughly Christian. 1 That faith is a mans good meaning & his good seruing of God. 3 That yee haue beleeued in Christ euer since you could remember. 11 That it is an easier thing to please God than to please our neighbour. 12 That yee can keepe the Commandements, as well as God will giue you leaue. Taken together, these points seem to express a frustration at the laity’s lack of intellectual engagement with the concept of faith. That is not to say that their faith was not complex, but it was certainly not structured in the reflective, self-conscious way demanded by men such as Perkins. Ironically, it seems that Puritan divines would have preferred a little less fiducia and a little more credentia from the laity: a faith based less in instinct, trust and emotion, and rather more in knowledge and intellectual acceptance. The most difficult (and therefore the most important) aspect of religion from the laity’s perspective was in striving to live according to the principles of Christian charity: God, in whom they had faith from their earliest years, was a comforting constant. And yet many of the laity had a strong sense that it was ultimately possible to be good and to do good things, and that such behaviour was pleasing to God. Elsewhere, Perkins also complained about those who felt that by reciting the Decalogue they were praying, and serving God. 7 That, if anie be strangely visited, hee is either taken with a Planet, or bewitched. This I think is a useful reminder that popular belief was not straightforwardly Christian: it contained a mixture of folklorish, traditional, pagan and other elements. In this sense it was a true patchwork. 13 That it is the safest, to doo in Religion as most doo. 14 That merry ballads & bookes, as Scoggin, Beuis of Southampton, &c. are good to driue away time, & to remoue hart quames. 20 That drinking and bezeling in the alehouse or tauerne is good fellowship, & shews a good kinde nature. Popular religion in the broadest sense was above all a communal activity, not an individual or even a family or household one. The reformation did not fundamentally change this, except perhaps amongst those who were the most literate in the new religious language. Even then, perhaps all it did was change the nature of the society with which those individuals of advanced faith sought to surround themselves. Good religion was to be expressed in good fellowship and good cheer, as much in the alehouse as in the church, as much with a lusty ballad as a reverent Psalm. ‘Hart quames’ for most people were to be banished with a merry ballad, not meditated upon as a means to repentance and the enrichment of a saving faith. 9 That a Preacher is a good man no longer than he is in the pulpet. They thinke all like themselues. 18 That yee know al the Preacher can tell you: For he can say nothing, but that euery man is a sinner, that we must loue our neighbours as our selues, that euery man must bee saued by Christ: and all this ye can tell as well as he. 17 That a man which commeth at no Sermons, may as welbeleeue, as he which heares all the sermons in the world. 16 That a man neede not heare so many Sermons, except he could follow them better. 28 That a man need not haue any knowledg of religion, because he is not book learnd. Finally, from the perspective of both the clergy and majority of the laity, a wide gulf existed between the two. The reformation certainly contributed to a widespread anti-clericalism, that is to say, an opposition to the clerical pretensions of the new godly graduate clergy. Complicated sermons were for educated people: the unlearned had nothing to gain thereby, because they already grasped the essentials of the faith: that all men were sinners, must be saved by Christ, and had an obligation to be charitable to their neighbours. This was all well and good as far as it went, but of course for Perkins and others there were nuances, complexities, caveats and implications without which these broad truisms were worse than meaningless. Such intellectual religion was unpopular in all senses: it was not for the great mass of people, who could profit more from each other’s good fellowship than a lengthy diatribe from the pulpit. The thing I’d like to draw from all this is that occasionally it is possible to lose sight of the wood for the trees. While it can be extremely interesting to interrogate popular belief in minute theological and intellectual detail, it is not always the most productive path to follow (there are of course many, many exceptions). For, by doing so, we can end up unwittingly forcing a resolutely anti-intellectual form of belief into a (for want of a better word) Perkinsian framework, and thereby doing it some violence, and just a little injustice. We must remember that popular belief was both simple and complex, both patchwork and quilt. It may be made up of innumerable diverse fragments, but it also had simple key priorities and a clearly defined basic form. 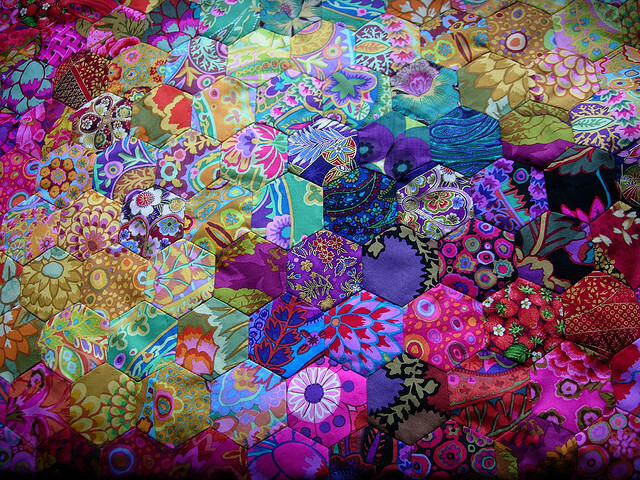 Each quilt may be unique, but quilts are also recognisably the same: a quilt is a quilt, and not a cushion cover, or a wall-hanging. Identity is full of contradictions, but not all contradictions have to be resolved. We each of us probably live with a series of competing and contradictory impulses and beliefs held in a kind of creative tension with one another, and the people of early modern England were probably no different. (Cambridge: CUP, 1991), p. 327. 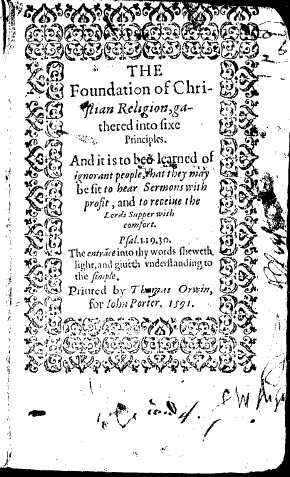 And it is to bee learned of ignorant people, that they may be fit to hear sermons with profit, and to receiue the Lords Supper with comfort (1591), STC2: 19710. When Thomas Feilder was hauled before the Reading authorities in 1624, on a charge of beating up a town constable, he offered a straightforward explanation for his actions: ‘drink was the cause’, ‘he was not himself’, and ‘he knew not what he did’. But what did early modern English courts make of such claims? Was drunkenness understood to mitigate responsibility for the offence, or did such reckless inebriation compound the transgression into a double misdemeanour of assault and drunkenness? This is just one of the questions I address in my latest article (that’s right, that opening vignette was just a snare to trap you into a self-promotional post). In the essay I ask – and attempt to answer, of course – a number of questions about seventeenth-century understandings of the effects of alcohol on mind and body. Did they share our concern about alcohol’s harmful impact on health, or was it considered ‘far better than any doctor in town’ for treating ailments? Was it used as an anaesthetic to numb the senses against the hardships of daily life, or did contemporaries guzzle booze because it was thought to ‘enrich all the faculties’ and act as a stimulant to mental activity? I’m dropping some clues here (let’s just say I’m not making those quotes up) but if you want to find out the full story then you should check out my ‘”It puts good reason into brains”: Popular Understandings of the Effects of Alcohol in Seventeenth-Century England’. It appears in a special edition of the journal Brewery History, edited by myself and Leicester lecturer Debbie Toner, under the banner of our Warwick Drinking Studies Network. It showcases the work of a number of early career scholars, and all the essays focus on aspects of early modern drinking culture, including the revolutionary introduction of hops to the brewing process (considered by some to mark the very origins of commercial capitalism. Well, by me anyway); the important role played by the alewife in serving up the country’s favourite tipples; and the symbolic significance of being allowed to use the best silver at a guild feast. You can download the introduction for free here, and from here you can order a copy of the edition for the very reasonable price of £4.50. An earlier draft of my article can be found on my academia.edu page, but please don’t cite from it. Shrove Tuesday has arrived again. It’s time to fry up some pancakes (preferably slathered with Nutella), join the London apprentices in smashing up some bawdy houses, and then pull up a chair in front of your computer to gorge yourself on early modern history blogging. To that end, we’ve just updated our blogroll. The mother of all historical blogrolls is Sharon Howard’s Early Modern Commons, but for those seeking a more selective list, our newly expanded set of links may be just the thing. In addition, we are also updating our even more selective sidebar of ‘Friends of the Monster’ to focus on those with whom we seem to interact most often in terms of links or comments. A few posts ago I briefly introduced Ralph Thoresby, the Leeds antiquarian and diarist whose intellectual and religious pursuits have caught my attention. My intention is to make this a regular series where I offer up some little gems from the Thoresby diary, but in these initial posts I want to provide a bit of background for the entries and the reasons why they exist in the first place. Several things have come to my attention over the last few weeks that deserve wider attention. Although I don’t have time to provide much commentary, I think our readers will find some of them of interest. The first concerns the wonderfully rough images that so frequently appear in our posts: broadside ballad woodcuts. The Bodleian Library recently announced the launch of an image-matching tool that will allow researchers to easily search for the many versions of a specific image across the library’s whole collection of ballad sheets. Eleanor Shevlin discusses the new tool in more detail over at EMOB. In light of Mark’s posts on early modern representations of working people, it would be fascinating to know how particular ‘occupational’ images are reused and recycled in different contexts and perhaps given quite different meanings. The second is Beat Kümin’s historical travelogue, Greifswald Glosses, exploring the largely autonomous parish communities in early modern Northern Germany. As a professor at Warwick, Beat is well-known to us here at the Monster and his blog offers a remarkable (and remarkably well-informed) look at the towns, churches, landscapes and even graffiti of this part of the former Holy Roman Empire. I think my personal favourite was the fourteenth-century gargoyle/collection-box at St Jacobi in Göttingen, but you may prefer the ruminations on low-ranked local football teams or the semi-fortified round churches of Bornholm. 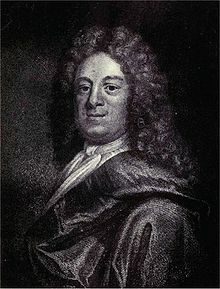 The third is an amusing ‘pop history’ article in The Atlantic on Daniel Defoe’s A Journal of the Plague Year (1722). It’s a well-researched piece, based on an interview with the Defoe scholar Katherine Ellison and incorporating plenty of (anachronistic) pictures, but what makes it interesting to me it that it is written by the magazine’s tech writer. The short version of his argument is basically that Defoe was an early modern blogger and, unlike some of today’s bloggers, he approached the wealth of information provided by that era’s new technology (e.g. newspapers) with a critical eye. I’m not sure I’m actually convinced, but it’s great to see another side of early modern history (beyond Henry VIII, Shakespeare and Oliver Cromwell) receiving some thoughtful discussion in such a high profile outlet. Finally, Katrina Navickas has a post at History and Today on E. P. Thompson’s The Making of the English Working Class (1963). There are, as she notes, a great many tributes and events happening this year to mark the fiftieth anniversary of its publication. However, what I enjoyed was hearing a little about her relationship with the materiality of the book itself, in all its tattered, dog-eared glory. I think I probably find myself reaching for Thompson’s Customs in Common (1991) more often than MEWC, yet I’m still strangely comforted to have a decent edition of the latter nearby. In her words, ‘despite my “digital humanism”, I still need those yellowed and annotated pages of the Penguin paperback to really get to the heart of Thompson’s writing’. Our very own Laura Sangha has set up a twitter feed for her students of ‘Religion, Society and Culture in Tudor England’: Tudorists rejoice! Grad students in and around London interested in early modern history really ought take a look at the talks hosted by the Birkbeck Early Modern society (and their tweets too). And lastly I belatedly wanted to thank the Birkbeck History PhD bloggers for reblogging one of our posts and recommend that all BBK doctoral students check them out.